Phillip Wallace of the United Association of Pipeliners Local 798 weighs in on the proposed Sandpiper project. 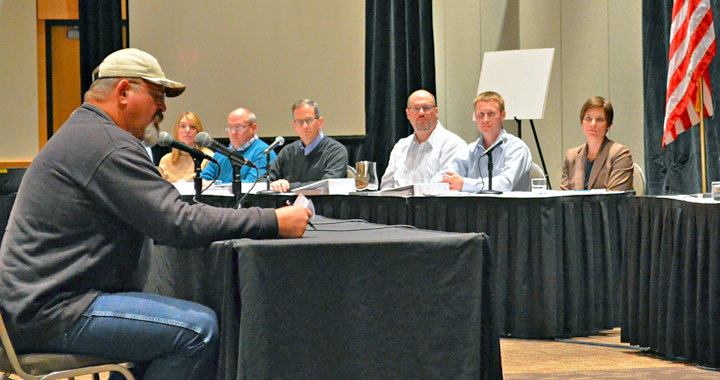 A series of five public hearings on a proposed oil pipeline through Minnesota opened in St. Paul yesterday, and members of several Building Trades unions stepped forward to support the $2.5 billion venture, projected to create 1,500 construction jobs. 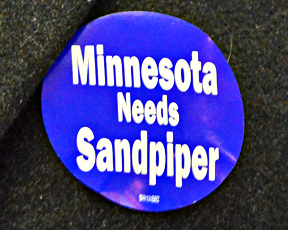 The Minnesota Public Utilities Commission is collecting public testimony at sites across the state this week regarding the Sandpiper pipeline, which would transport crude oil from North Dakota’s booming Bakken region to terminals in Clearbrook and Superior, Wis.
Union members like David LaBorde of Duluth-based Teamsters Local 346 touted the jobs Sandpiper would create for northern Minnesota workers and the potential boost for the area’s struggling economy. Northern Minnesota isn’t the only area that would benefit from Sandpiper. Many supporters at the St. Paul hearing said Sandpiper would ease congestion in the state’s rail system and reduce the risk of accidents in highly populated areas. Three of four rail routes used to transport Bakken oil cross through the Twin Cities. The new pipeline would enable parent company Enbridge to transport 225,000 barrels per day from the Bakken to its Clearbrook terminal, and 375,000 barrels per day from Clearbrook to Superior. That’s oil that might otherwise travel through Minnesota by train. The proposed Sandpiper route through northern Minnesota. Sandpiper also would yield about $25 million in property taxes annually for local governments in Minnesota, according to Enbridge. And increased domestic oil production helps keep fuel prices down and reduces the country’s reliance on less stable foreign sources, supporters noted. Some opponents of the pipeline worried that Sandpiper’s 616-mile route passes too close to the headwaters of the Mississippi River and poses a threat to Minnesota’s “Lakes Region,” including Cass and Crow Wing counties. Others argued construction of the pipeline would contribute to climate change. But Matt Duncombe, a skilled pipeliner from East Grand Forks, said pipelines are the safest means of transporting crude oil because Enbridge, its contractors and their employees make safety their top priority during construction. “Enbridge does more to set and enforce high quality and safety standards, in my experience, than any other pipeline owner I’ve worked for,” Duncombe said, noting the company’s use of third-party inspectors to monitor safety during construction. Supporters of the pipeline wore stickers to the public hearing. Duncombe, a member of Laborers Local 563, said he received pipeline-specific, hands-on training at the union’s Lino Lakes facility – training he has since used as a laborer and foreman on the environmental crew during pipeline construction projects. Members of Operating Engineers Local 49, the Pipefitters union and other labor unions were scheduled to provide testimony at the hearing as well. They appeared before Judge Eric Lipman, a specialist in dispute resolution with the state’s Office of Administrative Hearings. The five-member commission is expected to issue a decision on approval of the Sandpiper pipeline in June.